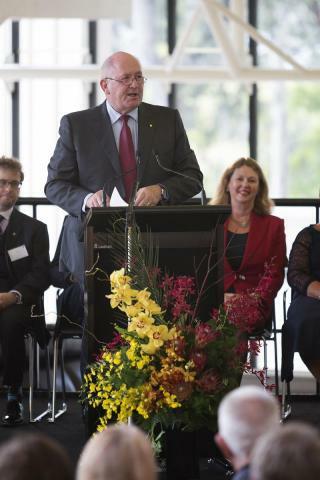 On Tuesday, 10 February 2015, the Governor-General, Sir Peter Cosgrove, presented awards to winners of the 2013-14 Governor-General’s Prize at a cocktail reception held in the Great Hall of the High Court of Australia, Canberra. The event was funded by Baker & McKenzie, CEFA’s principal partner for 2014. Speakers at the event included the Governor-General, Chief Justice Robert French, Aboriginal leader Patrick Dodson, Baker & McKenzie’s national managing partner, Christopher Freeland, RECOGNISE’s joint campaign director, Tanya Hosch, Justice Susan Kiefel, who chaired the judging panel, and CEFA’s chairman, Major General Michael Jeffery. The event marked the tenth anniversary of the Governor-General’s Prize, which has been judged each year by a panel chaired by a different Justice of the High Court. Over 240 guests, including all current Justices of the High Court and Attorney General George Brandis QC, numerous indigenous leaders, and prominent figures from legal, academic, political, and military life, mingled in the Great Hall with past and present winners of the Governor-General’s Prize. All reported enjoying the convivial atmosphere, which was enhanced by music for clarinet quintet performed by members of the Omega Ensemble (City Recital Hall’s ensemble in residence), and a selection of canapés from Sitting Ducks. The Governor-General and Lady Cosgrove mingled with guests after a brief ceremony, in which the Governor-General presented the Winterton Cup to Bowen Fox, a student of law and international studies at the University of Sydney, who was placed first in this year’s essay competition. Sir Peter said, “During my tenure as Governor-General, I look forward to working with … all men and women of CEFA, as you raise public understanding and appreciation of our Constitution, its history and contemporary relevance. The 2013-14 Governor-General’s Prize was sponsored by Reconciliation Australia through the RECOGNISE campaign, and invited undergraduates to write essays on topics related to constitutional recognition of indigenous Australians. Kerry Jones, chief executive of CEFA, was overjoyed with the success of the event which she believed to be the finest CEFA has ever held, and which will consolidate beyond doubt CEFA’s credentials to partner with the Australian Government in future civics initiatives. She sees the proposed referendum on constitutional recognition of indigenous Australians as an important opportunity to improve attitudes towards civic life in Australia. “Too many Australians feel cynical about the power of their vote. The proposed referendum is a rare opportunity to reverse the disillusioned attitudes that threaten our democracy. CEFA will seize this opportunity by utilising ground-breaking educational initiatives that reach all Australians,” Mrs Jones said. 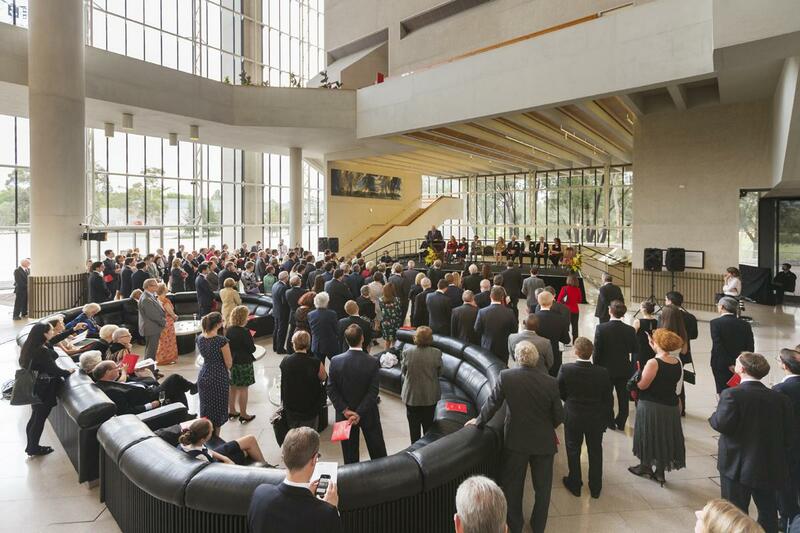 The Great Hall of the High Court of Australia, 10 February 2015. The Governor-General delivering the keynote address.